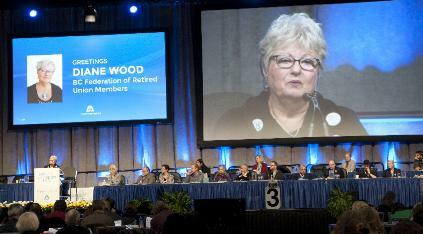 Diane Wood, president of BC FORUM, brought well-received greetings to delegates at the 56th convention of the BC Federation of Labour in Vancouver in November. 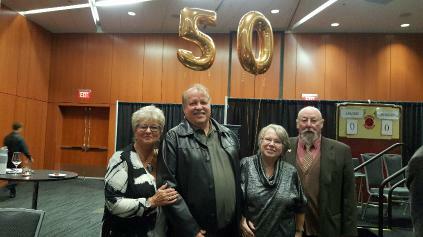 50th Anniversary Celebration of New Westminster & District Labour Council October 22/16 BC FORUM Board Members Diane Wood, John Radosevic, Miriam Olney and Russ. St. Eloi. BC FORUM Vice President Bill Silvester, left, and President Diane Wood attended the COSCO BC Conference in Richmond that took place in late September 2016. At the Vancouver City Hall October 1st flag raising ceremony honouring the United Nations International Day of Older Persons. 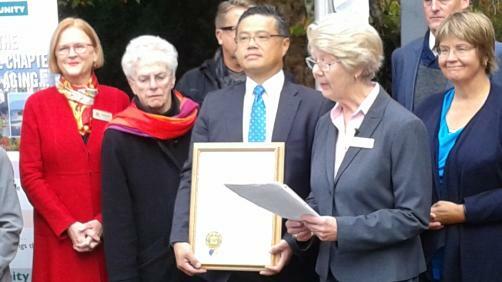 Acting Mayor Raymond Louie (holding framed declaration pictured above) read the U.N. Proclamation and Barb Mikulec, BC FORUM Board member spoke about issues for seniors. 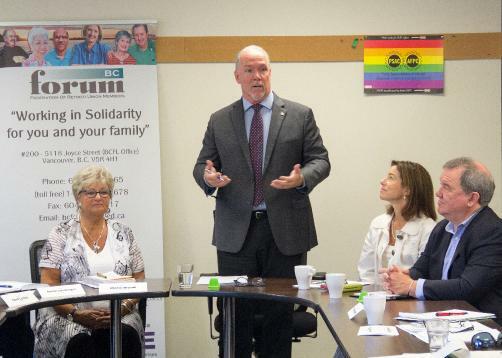 September, 2016 - BC NDP Leader John Horgan, along with MLAs Selina Robinson and Shane Simpson, visited with the BC FORUM Board of Directors in September, 2016. September, 2016 - BC FORUM Board members attend the COSCO BC Conference in Richmond, BC. 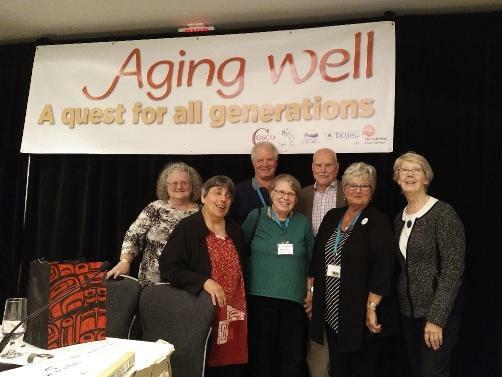 From left are Agnes Jackman, Marion Pollack, Bill Silvester, Miriam Olney, Fred Girling, DianeWood and Barb Mikulec. September 10, 2016 - Congratulations to Dawn Black, retired MLA and MP, shown above with, from left, Miriam Olney, BC FORUM Secretary; Irma Mohammed, BC FORUM member and Diane Wood, BC FORUM president. Dawn was the recipient of the Annual Rosemary Brown Award for Women 2016 presented at the 3rd Annual Rosemary Brown Memorial Conference. Read more about the event and the award here. 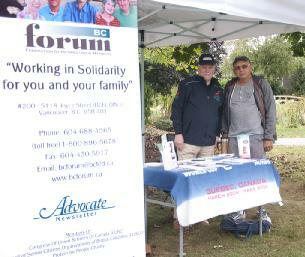 Labour Day 2016 - Thank you to Brother Fred Girling and Brother Gord Savard, members of the BC FORUM Board, for taking the time to volunteer at the BC FORUM display table at the 7th Annual Labour Day Picnic in Abbotsford sponsored by the Fraser Valley Labour Council and the United Way of the Fraser Valley. Download and read letter here. 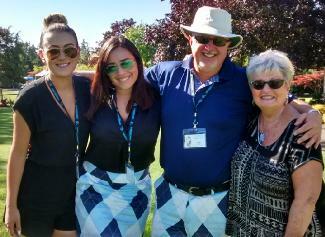 Diane Wood, President of BC FORUM, attended the BC Building Trades Golf Tournament on July 20 and is shown here with Tom Sigurdson, Executive Director, and staff. 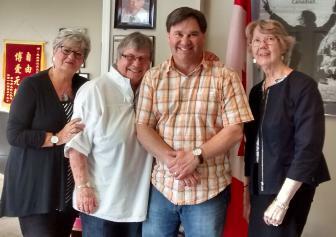 On July 11, 2016, Diane Wood, President of BC FORUM and General Vice-President of of the Council of Senior Citizens Organizations of BC (COSCO), joined with Lorraine Logan, President of COSCO and Barb Mikulec, BC FORUM Board Member and General Vice-President COSCO to meet with Don Davies, NDP MP and Vice-Chair, House of Commons Standing Committee on Health, to discuss Pharmacare. BC FORUM Member Meet and Greet, Kamloops, May 13. 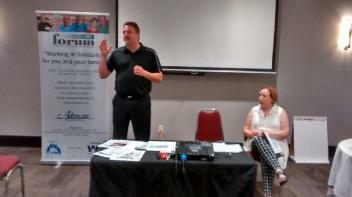 Pictured are Mike Porteous and Linda Kobayashi from Working Enterprises Consulting & Benefits Services speaking with members about BC FORUM group benefits. 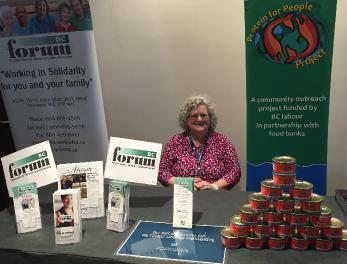 Agnes Jackman, BC FORUM Regional Rep. and Vancouver & District Labour Council delegate staffing BC FORUM booth at Health Sciences Association (HSA) Convention May 6, 2016. 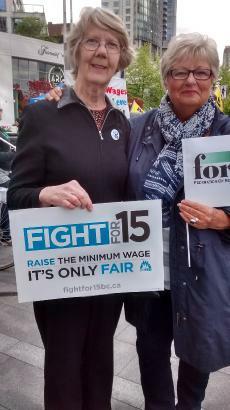 Diane Wood, President BC FORUM and Barb Mikulec, BC FORUM Board Member at Fight for $15 National Day of Action Rally in Vancouver April 15, 2016. 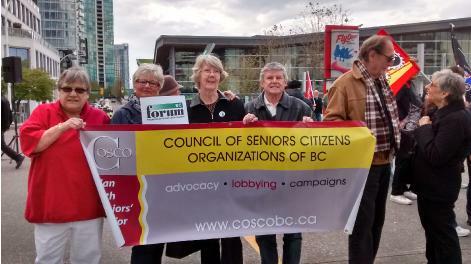 Both Diane and Barb are on the Executive of the Council of Seniors Citizens Organizations of BC (COSCO) with Diane representing BC FORUM and Barb representing the BC Retired Teachers Association (BCRTA). Diane Wood, President, BC FORUM with BC FORUM Board member Barb Mikulec at the Fight for $15 National Day of Action Rally, Vancouver April 15, 2016. 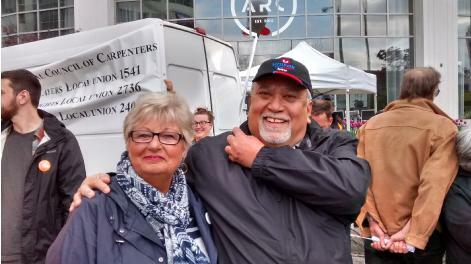 Diane Wood, President BC FORUM, with Raymond Raj, newly appointed BC FORUM Regional Rep. and Labour Council Delegate for Kitimat, Terrace & District Labour Council at Fight for $15 National Day of Action Rally, Vancouver, April 15, 2016. Presentation by Povnet to BC FORUM Board on March 22nd. 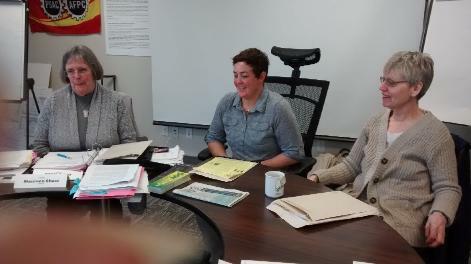 L to R: Maureen Shaw, FPSE, BC FORUM Board member; Nicky Dunlop, Executive Co-ordinator Povnet, and Renee Poley, Povnet Facilitator. 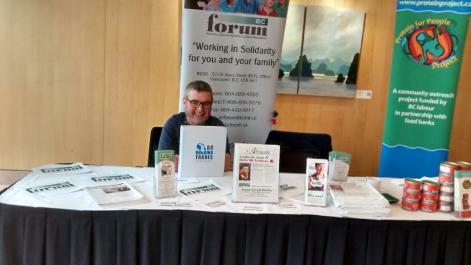 April, 2016 - Michael Ferguson, BC FORUM Regional Rep. and delegate to the Victoria & District Labour Council staffs the BC FORUM display table at the 2016 BC Building Trades annual convention in Victoria. March, 2016 - BC FORUM has penned a letter to Prime Minister Justin Trudeau asking for door-to-door mail delivery by Canada Post to be permanently restored. Read more here. 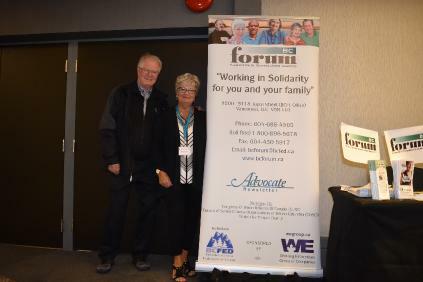 January 2016 - From left: Miriam Olney, Board Secretary, Mike Porteous, WE Benefits and Consulting and Diane Wood, President, BC FORUM at WE Consulting and Benefits Booth, CLC Winter School Trade Fair, Jan. 31/16. 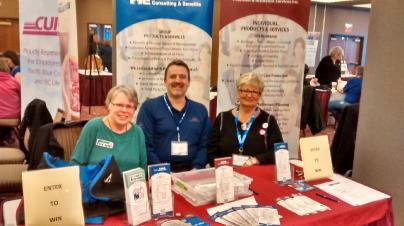 WE Benefits and Consulting is BC FORUM’s benefit plan provider. 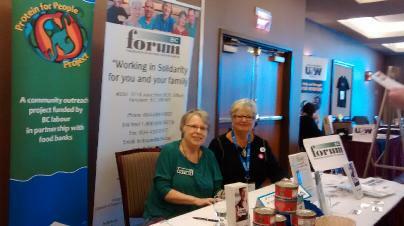 January 2016 - From left, Miriam Olney, BC FORUM Board Secretary and Diane Wood, President, attended at the CLC Winter School at Harrison Hot Springs at BC FORUM Booth, CLC Winter School Trade Fair, Sun. Jan. 31/16.